Nottingham Trent’s Pavilion building, a space for collaborative learning and socialising, is at the heart of the university’s Clifton campus. It is also central to the university’s sustainability strategy: the building is cleverly designed to generate more energy than it consumes. The Pavilion optimises energy performance using Passivhaus principles, a type of design that creates buildings that require little energy for space heating or cooling. The full height glazed facade, giving the building its iconic look, is energy efficient. Automated louvers (shutters) provide natural ventilation, while floods of daylight throughout the building enable reactive LED lighting that responds to external light levels. Low energy, air-tight design maximises operational efficiency – for example, revolving doors minimise annual heat loss, while huge 96kW solar panels on the roof supply energy for building services. Outside of the building, a landscaped plaza provides habitats for biodiversity, benefiting wildlife and attracting native species to its outdoor spaces. The design has achieved a carbon negative energy performance certificate rating of A+. Renewable energy sources, such as solar panels on the roof, have resulted in a building emission rate of -3.94 kgCO2/m². In other words, it’s a carbon negative building. In addition to this, 95% of waste from the project was recycled and 80% of the construction workers involved in building the Pavilion travelled to the site from within 20 mile radius of campus. This not only helped ensure support for the local community and economy, but also reduced the project’s emissions. The project was entirely self-funded and cost approximately £10m. It was delivered within a 15 month programme. 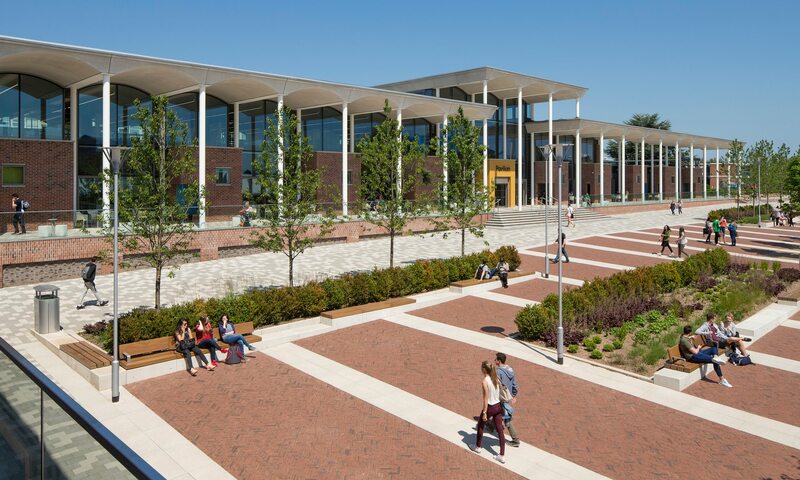 Essex Business School (EBS) is the UK’s first zero-carbon business school building. Sustainable features include its timber frame, ground source heat pump, solar panels and efficient lighting. It also features a winter garden with an Eden Project-style roof, which creates its own microclimate and is the centrepiece of the building’s energy efficient design. But it’s not just the sustainable design that makes the building special. Inside, students enjoy a virtual Bloomberg trading floor, flexible group learning spaces and dedicated postgraduate facilities. There are also plenty of informal meeting spaces, including a light-filled atrium where staff and students can share ideas or do business. It’s a bustling and lively place: EBS is home to over 1,700 students from 130 different countries, including 300 postgraduates. The building also forms a link between the university campus and the neighbouring Knowledge Gateway research and innovation park, and so helps create a business-focused environment where students interact with external businesses. The budget for the project was £21m capital funding. Built on a former industrial space, Cardiff University’s Brain Research Imaging Centre (CUBRIC) has brought cutting-edge science to a neglected area of the city. The building is four times the size of the previous facility and enables all staff to be housed in one place alongside multiple MRI scanning facilities, MEG scanning, EEG facilities, brain stimulation, sleep laboratories and drug trial facilities. CUBRIC compares favourably with the leading centres in the US, housing one of only two Siemens 3 Tesla Connectom systems in the world – an immensely powerful facility described as the Hubble space telescope of neuroscience. The building houses a unique cluster which brings clinical facilities together within an academic setting, to promote increased collaboration with clinicians and researchers in the NHS. It also encourages involvement from the pharmaceutical industry, as well as other industries allied to neuroimaging development. Since opening, the centre has received increasing numbers of expressions of interest from researchers keen to use the new facilities, including industrial partners. CUBRIC has also been given the status of the National Microstructure Imaging Facility, further boosting the university’s reputation as a centre of excellence for neuroscience and mental health. The total cost of the building was £44m, including the construction as well as the specialist equipment housed within it. Over £27m of the cost of the project was provided by the following funders: Wellcome Trust, Medical Research Council, EPSRC, the Wolfson Foundation, Welsh government and the European Regional Development Fund.